The "Camellia Nomenclature" and supplements are published by the Southern California Camellia Society. 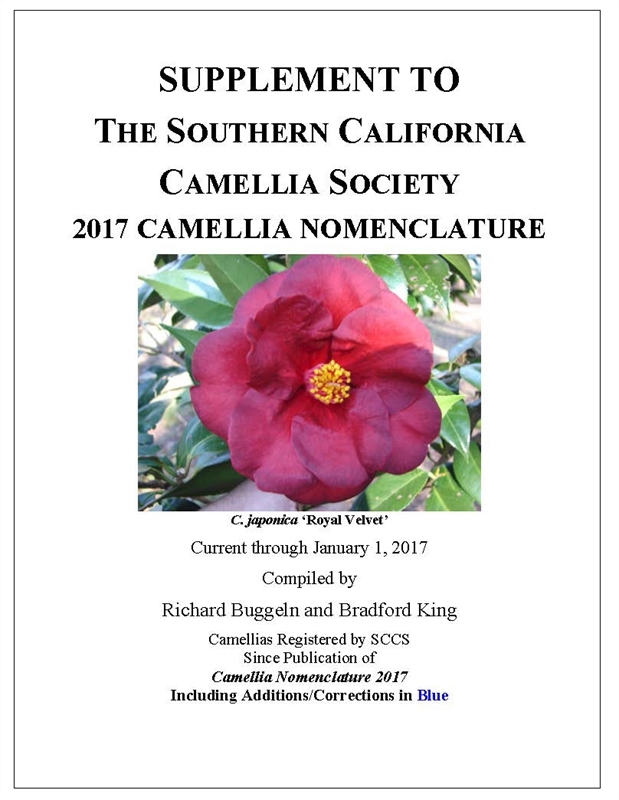 The Camellia Nomenclature is published by the Southern California Camellia Society (SCCS) as the nomenclature publication. To win an American Camellia Society Certificate or Award, (except for seedlings and sports)the variety MUST be listed in the 1981 Camellia Nomenclature Historical Edition, the current edition of Camellia Nomenclature, or the “Camellia Nomenclature Supplement”. The publications are produced to decrease confusion and settle controversies surrounding the names of both old and new cultivars of camellias and to present a short, concise nomenclature list for the information and protection of the amateur grower generally. Supplement of new registrations and approved changes to the most recently published edition can also be found Southern California Camellia Society Web site. Click here to view instructions on proposing changes to the Nomenclature Research Committee.